RIP, RAY HARRYHAUSEN: the special-effects titan who transformed fantasy on film #3dthursday « Adafruit Industries – Makers, hackers, artists, designers and engineers! Artists, puppeteers, designers, filmmakers, critics, and dreamers all over the world are sharing their own particular tributes to special effects genius Ray Harryhausen, who died Tuesday morning at 92. There are those who point out his influence upon, and even transcendence over, computer animated special effects. And there are many, such as Aardman Studios’ Nick Park (Wallace and Gromit, Chicken Run) and Laika’s Sam Fell (ParaNorman) who cannot imaging doing what they do without having encountered his work. There’s certainly no end of his touch upon 3D art, animation, modeling, and, yes, 3D printing — and so we celebrate him here, too, on Adafruit’s #3dthursday. I had the pleasure of meeting him almost a decade ago when working at the Lake Placid Film Forum festival where a giddy, star-struck Guillermo del Toro held a discussion with Harryhausen about his life’s work. Harryhausen shared with his audience griping stories about the painstaking efforts and unexpected challenges that went into some of his masterpieces — and he brought along actual scale character models to demonstrate. He let me hold one of his skeletons from Jason and the Argonauts and his Medusa from Clash of the Titans, and I fell completely under his spell. Farewell to Ray Harryhausen, who was as generous with his knowledge, passion, and advice in the years after his most elaborate stop motion works were complete as he was as a box office draw — our contemporary Georges Méliès — whose name was synonymous with quality and artistry in special effects, whose creatures came to life and continue to inhabit our dreams. 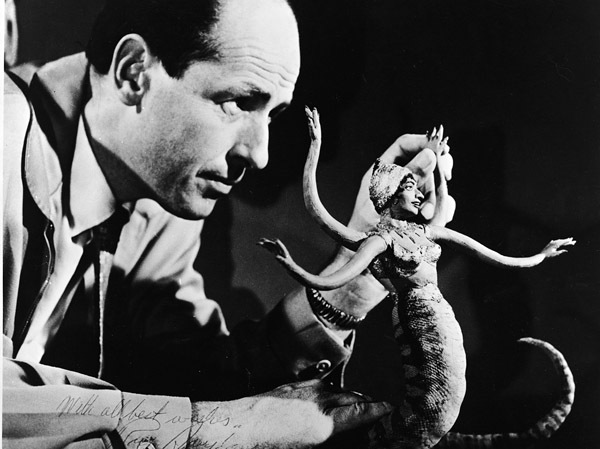 AT JUST 13, RAY HARRYHAUSEN stumbled upon an illusion that changed his life. His parents liked to take him to the picture show — “Metropolis,” perhaps, or “The Lost World” — but on this particular day in 1933, he went to see “King Kong.” And there, sitting in the dark, young Raymond Harryhausen saw the light. Ray Harryhausen, in 2004. (Mike Appleton – AP) “King Kong,” with its beastly brawling, featured the stop-motion mastery of Willis O’Brien. Ray exited the theater “haunted” by the film, he would later say — beguiled by how he had escaped into the surreal from the mundane. He became “a ‘King Kong’ addict.” The boy who made La Brea Tar Pit dioramas in school had just witnessed how one’s sculpted art could gurgle and rattle and slither to life. He would soon learn about stop-motion from a friend’s dad, an employee at RKO, and his garage became his lab, as he played God with his molded model creatures, frame by painstaking frame. Fast-forward to 1949, and again a stop-motion gorilla fills the silver screen. Again it’s the guiding hand of O’Brien at the animated helm. Only this time, helping to summon most of the magic of motion is Ray Harryhausen. His boyhood addiction has propelled him into the business, to work on “Mighty Joe Young.” He had worked with animation while in the Army. Now, one of the great Hollywood careers is born. Within several years, Ray Harryhausen would make the first of his several Sinbad adventures, and then came his breakthrough with Warner Bros.’ technically influential “The Beast from 20,000 Fathoms.” Harryhausen devised camera tricks using rear projection and miniature split-screens and masked-out space, as he mastered how to combine stop-motion and live-action in the same frame. Trick by trick, he became the art form’s greatest magician. Not long after came his masterpiece, 1963’s “Jason and the Argonauts” — complex, deliberate animation that sometimes yielded only a half-second of footage a day. The live actors tangle convincingly with such creatures as Thalos, the towering bronze statue-defender of Crete, and a sword-wielding army of skeletons. The battle scenes are dynamic, the interaction of flesh and coal-eyed armatures is magnificent, and these scenes will help profoundly influence the next generation of technical wizards. And here is where the cinematic inheritance has a perfect symmetry. Harryhausen glimpsed his life’s work at age 13. What he, himself, would hand down were stop-motion scenes that had that same enchanting power to inspire young minds. “I probably wouldn’t be a filmmaker today if it weren’t for him,” Sam Fell, co-director of Laika’s Oscar-nominated stop-motion “ParaNorman,” tells Comic Riffs. “My mum took me as an impressionable 9-year-old to the local cinema to see the Sinbad movies. I was completely enthralled by the exotic locations, the malevolent villains and most of all by the creatures Ray created. Aardman Studios’ Nick Park (Wallace and Gromit, “Chicken Run”) has called Harryhausen the grandfather of stop-motion animation. And Steven Spielberg has said that Harryhausen is the father of the business that is filmic science fiction and fantasy and adventure. That skeleton crew of earth-born warriors — and first experiencing them through a child’s eyes — has stayed with LucasFilm director/animator Brenda Chapman. Through “One Million Years B.C.” and “The Golden Voyage of Sinbad,” Harryhausen perhaps got to challenge himself most with 1981’s “Clash of the Titans,” as elaborate, ever-kinetic creatures like the serpent-maned Medusa interacted deftly with the live actors. In 1992, Harryhausen finally was rightly recognized for his genius with an honorary Oscar. On Tuesday, Raymond Harryhausen — who was born in Los Angeles in 1920 — died in London, where he had lived since the ‘60s. He was 92…. Read more. And shared below are several more videos demonstrating his work!